Garlic and basil flavor these Italian Style Baked Zucchini Chips. 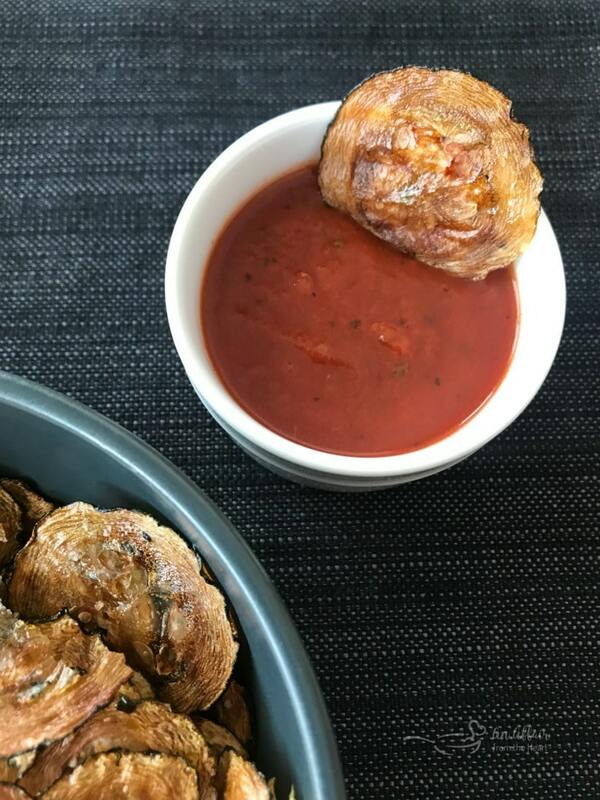 Serve them up with marinara for dipping and watch them disappear! This fun holiday was started by a man named Tom Roy, in Pennsylvania. He suggests that waiting until the dark of night to sneak a zucchini or 5 right onto your neighbor’s porches. 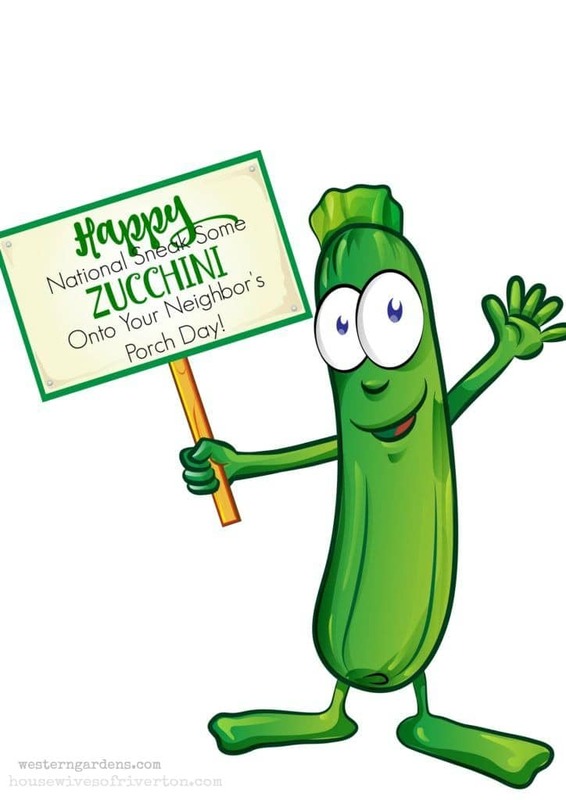 Saying that after a while when they see you standing on their porch with armfuls of zucchini day after day, may lead them to not answering. I mean you can only bake so much zucchini bread, am I right? 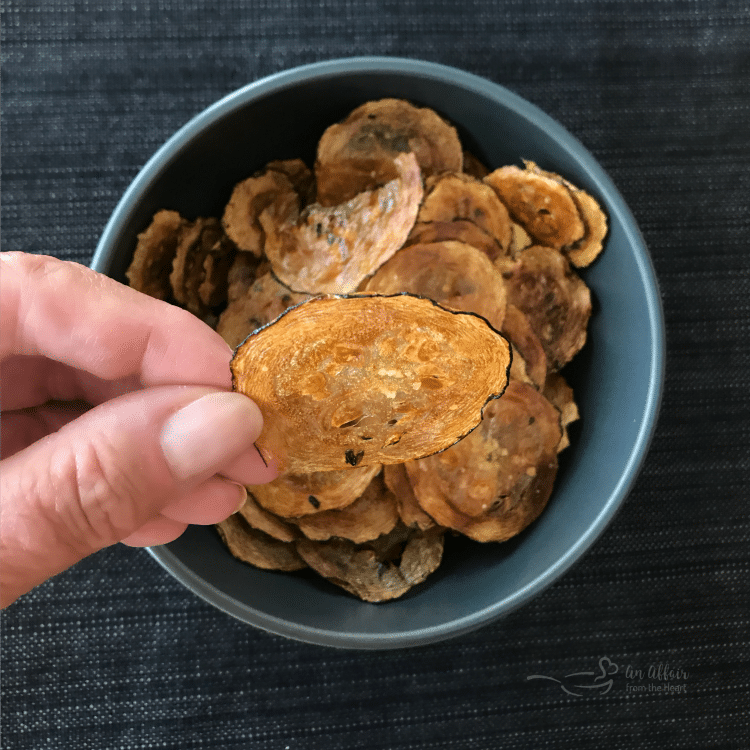 A while ago, I made homemade baked potato chips, and boy were they good! 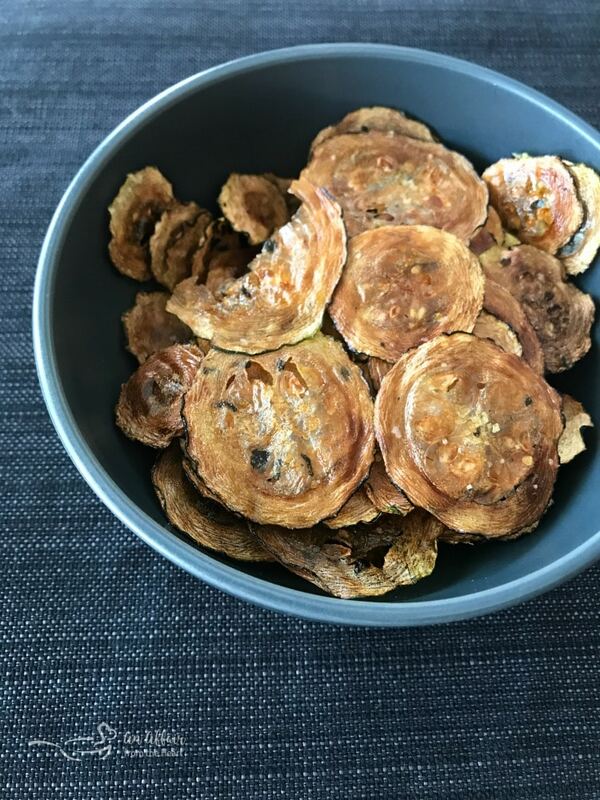 I’ve had zucchini chips in restaurants, but I had never tried my hand at making them at home. They take a little time to prep, but they are so worth it!! 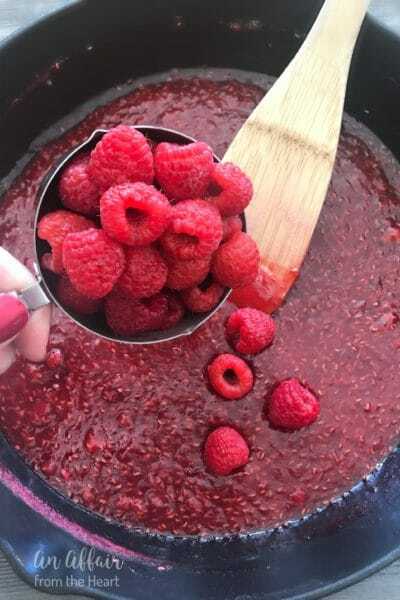 Many of the recipes I had found while scouring the internet were made with little to no seasoning, and typically accompanied a creamy dip of some sort. That’s all fine and good, butI wanted to have something different. I love Zucchini & Tomatoes, and serving them with a little Italian twist and marinara seemed like a magnificent idea. 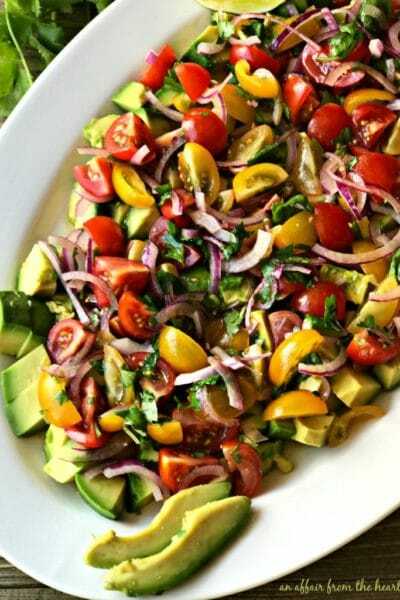 Fresh tomatoes and Zucchini with onion and basil make a perfect light & fresh summer (or anytime) side dish! This Bone Fish Grille copy cat recipe is one of our favorites! When I mentioned it takes some prep, it’s not hard, just takes a little time. 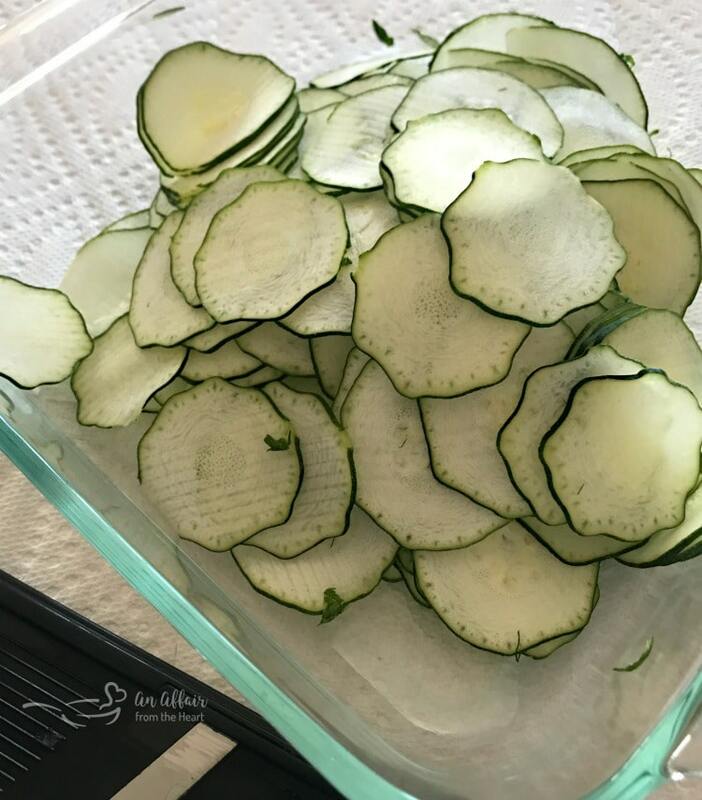 Slice the zucchini thinly into “chips.” They won’t seem wet, but trust me, you’ll be surprised at how much moisture comes out of them. Lay them on a paper towel in a single layer, then place another towel over the top and gently press down. You can also place a large cookie sheet on top to help absorb the moisture quicker. I left mine this way for about 30 minutes. Line a cookie sheet with parchment paper. Brush with Olive oil seasoned with basil and garlic. Lay a single layer of zucchini out on the oiled paper, then lightly brush the tops with more oil. Then you’re going to bake them low and slow, pulling all of the moisture out and getting them nice and crispy. Serve them up with a side of marinara sauce. 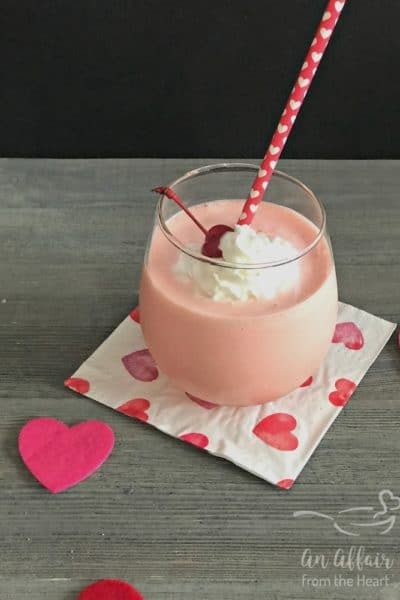 You can use store bought, or try making your own! I love this super Easy Marinara Recipe from Lisa’s Dinnertime Dish! Ready to get baking and dipping? Let’s do this! Place garlic powder and basil in the olive oil to let it marinate while you slice your zucchini. Slice zucchini very thin. 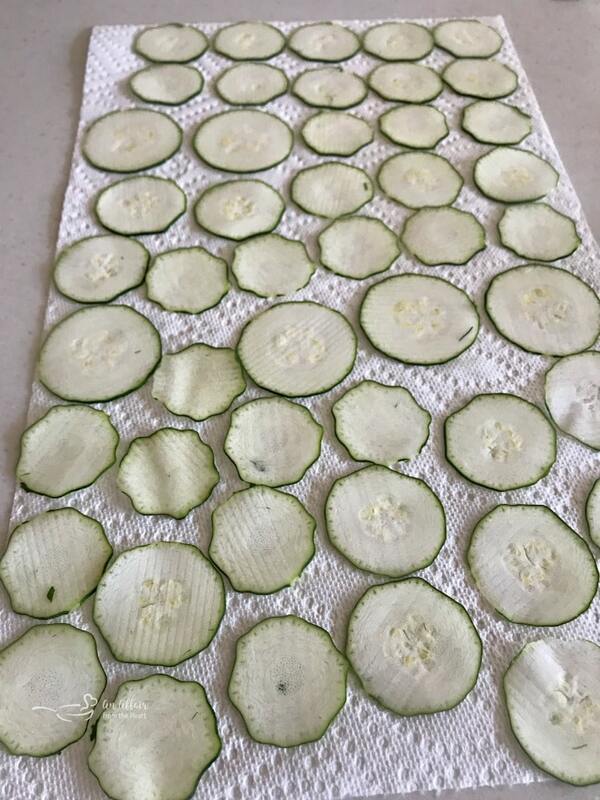 Lay zucchini on paper towel in a single layer, and place another towel on top, gently pressing to get the moisture out. I let mine sit for almost 30 minutes. Brush the parchment paper lightly with oil. Place the zucchini in a single layer and brush tops lightly with oil. Bake for 90 minutes, or until chips are crispy. Serve with marinara for dipping. Do YOU have some zucchini you need to leave? Look at this cute printable tag I found, made by Housewives Of Riverton over on WesternGardens.com. 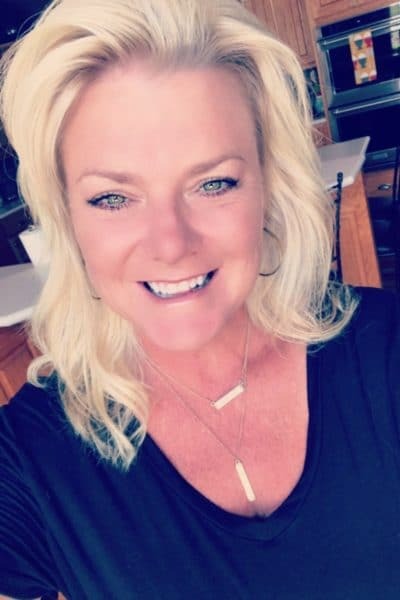 Who wouldn’t smile? I can’t wait to try these! They’re a great guilt free snack and perfect to eat on a low carb diet! They are perfect for that!! 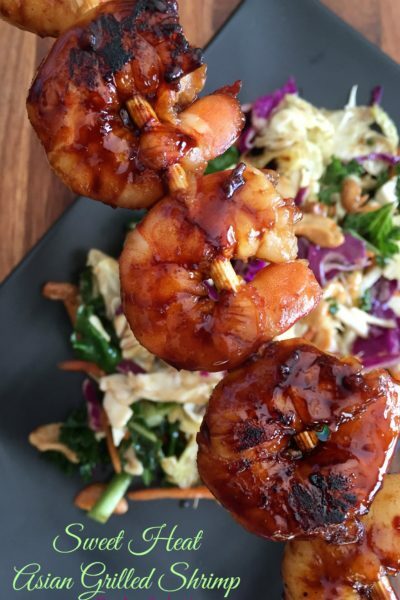 Once again, you are introducing us to an incredibly new and delicious-looking recipe! We are always looking for ways to put our never-ending summer zucchini to good use and can’t wait to try these! 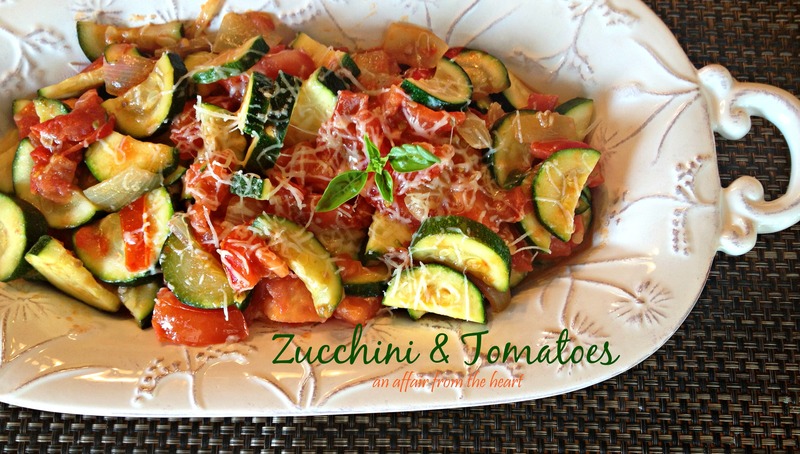 This is a fun and tasty way to use that zucchini! Love your chip recipe, they look just fantastic! And all the yummy recipes for zucchini, perfect for this time of year! 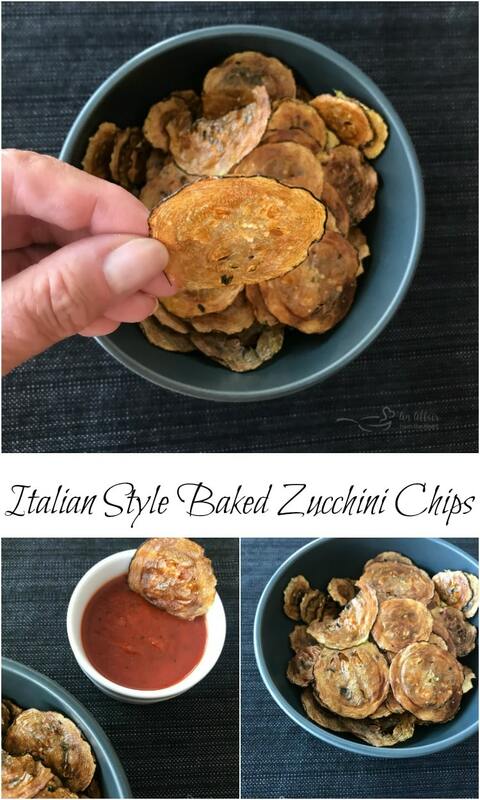 Im overwhelmed with zucchini at the moment and this is one way I haven’t tried! Cant wait to use some for this recipe! 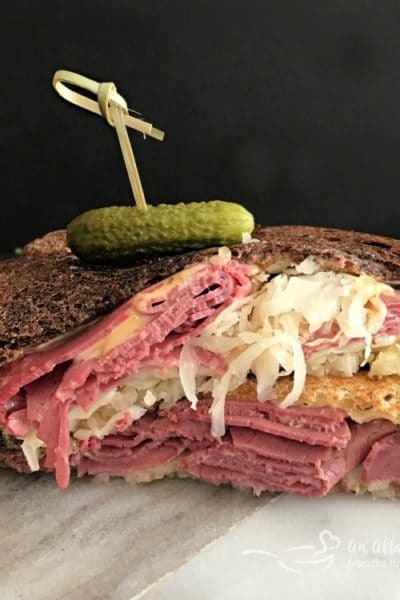 Its right up my yummy alley! I love this no guilt snack! Love this!! I just picked up a bunch of local zucchini and am working on finding different new recipes to try! This is going to be great for sure!! 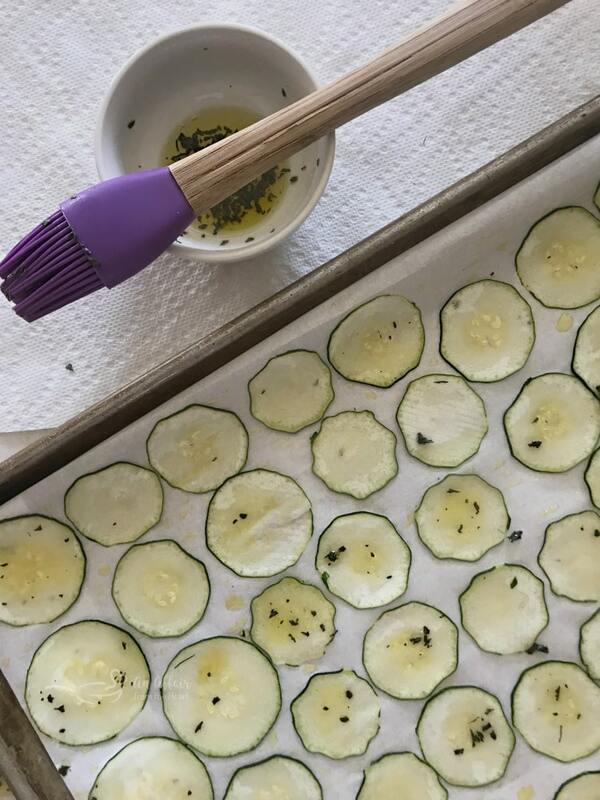 These zucchini chips are the perfect healthy snacks to have around the house and I love the dipping sauce too! Brook is going to die over these! Finally, a paleo snack that isn’t grapes!! I might crush these up on some cheese toast too! What a fantastic and great snack! I bet they are so addicting. I cannot wait to try these this weekend!! These chips look so addicting! I can’t wait to try them! What a fantastic, light and healthy snack! There’s always some zucchini that needs to be used and this is a great way to do that. Pinning this recipe to make this week.